Okay.... After months and months of being stranded inside the house. 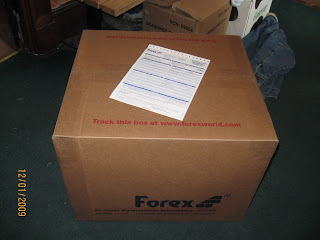 I have finally submit this box to the agent from OLEAN, NY who is also a Filipina who collects this balikbayan boxes to be send to the Philippines. It took me forever to drop this box because of the ride, yes I do have a husband but he has more important things to deal with. So I have decided to asked a favor from my friend Courtney to give me a ride to send this box. And just last Thursday we finally did it. Sent this box and met the Filipina who is also a Cebuana. Finally I don't like to talk Tagalog because my tongue twist every time I talked Tagalog. And yes, this will be on freight starting last week of January or first week of February. Hopefully that custom won't be opening or even stealing some of my stuffs, because I have heard so much negative about these Filipino customs. HI! just dropping by. it's nice to be here. naay chocolate sulod sa emo box novs! safe man ang forex, kung madawat na sa emo fam kay picturan sila sa ga deliver..
Hello Nova. I sure hope that your box will arrived safely to your family. When I was still living in the Philippines, my boyfriend had sent me lots of packages and most of them did not reach me at all. Sad that we can't trust the people in the postal service in our country. WEll well... I am pretty sure that your box will get to its destination.